frequency bands for Wi-Fi, WiMAX and PCS/cellular technologies, respectively, in a single unit. Measuring 5.1 x 4.95 x 1.7 inches (129.6 x 125.8 x 43.1 millimeters), the omnidirectional, combination antenna is targeted at a variety of fleet tracking and telematic applications. 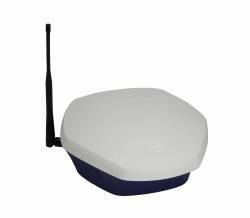 Antenna gain figures include the following: voice/data RF element, 2.8dBi (806-960 MHz), 3.3dBi (1710-2170 MHz); broadband wireless RF element, 3.9dBi; GPS, 3.5dBic (amplifier gain, 27dB). A custom over-molded gasket is designed to provide protection against water or dust under severe environmental conditions and complies with the National Electrical Manufacturers Association (NEMA) and International Electrotechnical Commission (IEC) Ingress Protection standards (IP56).